Frederic S. Pearson, Professor of Political Science and Director, Center for Peace and Conflict Studies at Wayne State University. A native Detroiter who spent 20 years teaching at the University of Missouri in St. Louis, Dr. Pearson received his Ph.D. from the University of Michigan, having done his undergraduate work at Oakland University. He is a recognized authority in the fields of international military intervention, arms transfer effects on wars, and civil and international conflict analysis. He has twice been senior Fulbright research professor, in the Netherlands and the U.K., having written on arms trade and crisis behavior in both countries. He has been recognized at Wayne State University as Gershenson Distinguished Research Professor and as Graduate Mentor of the Year. Among his six books are Arms and Warfare: Escalation, De-escalation, Negotiation (1994 with Michael Brzoska); The Global Spread of Arms: Political Economy of International Security (1994); and Arms and Ethnic Warfare (with John Sislin) in 2001. 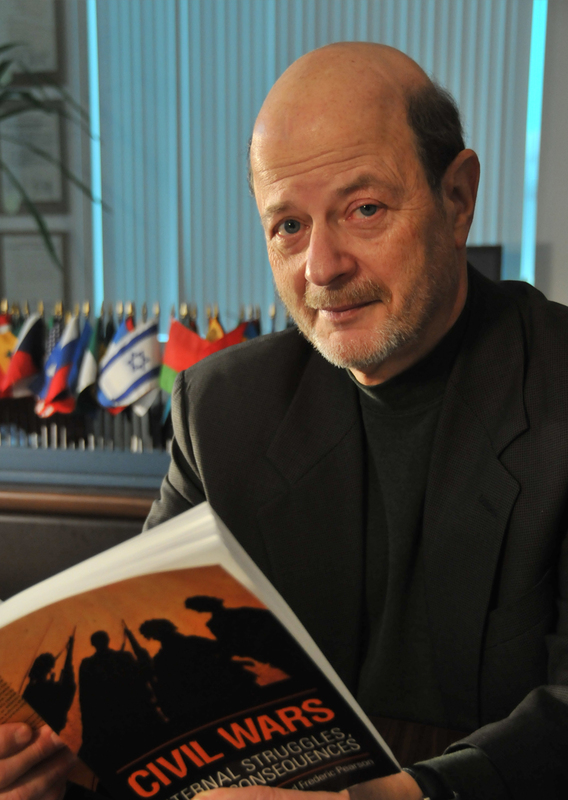 Along with Dr. Marie Olson-Lounsbery, in 2009 he authored a volume on the causes and solutions to civil wars for University of Toronto Press, and in 2014, with co-author Dr. Nahla Hamdan, published Arab Approaches to Conflict Resolution: Mediation, Negotiation and the Settlement of Political Disputes (Routledge). He was editor for the special issue of the Journal of Peace Research on “Identity-based Disputes and Conflict Management,” 2001. Other relevant articles include a study of mediator effectiveness in ending civil wars in the Conflict Quarterly and “Arms Trade: Economics of,” in the Encyclopedia of Violence, Peace, and Conflict (with Sislin and M. Olson). In 2000 Dr. Pearson was designated a conflict resolution consultant to the U.S. Commission on National Security/21st Century in Washington. In 2007 he lectured to the UN staff on global conflict and to an EU seminar on arms and civil war; and in 2014 presented a peacemaking workshop to joint Palestinian-Israeli trauma treatment professionals in Jerusalem. Dr. Pearson has developed programs for resolving community disputes regarding ethnic and immigrant relations, has led delegations of Detroit urban high school teachers to Japan and international conflict delegations to the former Soviet Union, and through Federal grants has twice hosted Middle East Partnership Initiative undergraduate students from across the Arab world for training in civic engagement. He has directed the Detroit Council for World Affairs, is past president of the Rotary Club of Detroit and serves on the Advisory Board of the Michigan Coalition for Human Rights. International politics and conflict; international economic analysis; political and civil conflict analysis; peacemaking, peacekeeping, peacebuilding. Twice Senior Fulbright Scholar (UK and Netherlands). Gershenson Scholar, Wayne State University. Graduate Mentor Award, Wayne State University. Arab Approaches to Conflict Resolution: Mediation, Negotiation and the Settlement of Political Disputes. Routledge, 2014. With Nahla Hamdan. * Reviewed in Middle East Journal, no. 1, 2016. “Organizational Networks in Post-Conflict Disarmament Efforts.” Technology, Ethics, and the Protocols of Modern War. Ed. by Artur Gruszczak. London: Taylor and Francis, forthcoming. With Andrea Kathryn Talentino and Isil Akbulut., 2017. "Mediation and the Challenge of Fostering Reconciliation in Ethno-Political Disputes: The Case of Guyana." The Handbook of Mediation: Theory, Research and Practice. Ed. by Alexia Georgakopoulos, Routledge, 2017. With Parideau Mars and Marie Olson Lounsbery. Peace-Making.” Sage Encyclopedia of Political Behavior. Ed. by Fathali Moghaddam. Sage Publications. 2016. “Group Structure and Intergroup Relations in Global Terror Networks: Further Explorations.” Terrorism and Political Violence. August,2015, on-line. With Marie Olson Lounsbery and Isil Akbulut. “Peacemaking in Intractable Conflict - A Contractualist Approach,” International Negotiation, vol. 19, 2014, pp. 1-34. With Sapir Handelman. PS 2810, World Politics; PS 4810, Foreign Policy of Major Powers; PS 5830, International Conflict and Management; PCS 5010, Internship in Peace and Conflict Studies; PCS 6000, Senior Seminar in Peace and Conflict Studies; PCS 6100, Graduate Introduction to Peace and Security Studies; PS 6830, Civil War and Conflict Processes; PCS 7800, Graduate Practicum in Peace and Security; PS 7810, Graduate Seminar in World Politics.